I don't like plastic guns, but the P-07 is awesome. Guy at the gun shop today was carrying his, you don't find too many buyers with complaints. Size is good. Runs like a top. Great pointing, but hey it's a CZ. If I HAD to carry a plastic gun, this would be it. I just ordered an OD Green P-07 for my CZ collection. One can never have too many CZ's. I’m only a couple days in to my CZ experience but I can see why one can never have to many. I'm already planning my next CZ. Having a hard time deciding: P-01 Omega or SP-01 Tactical.. This was my first time shooting my CGW P07. 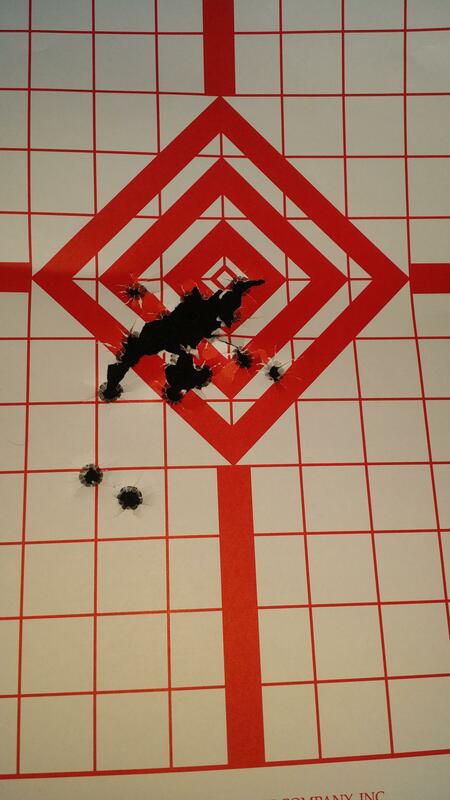 Target was at 25 yards, I was sighting in my RMR. This is my 99% carry pistol. I will always add: buy in person and be happy. You can save up to $75 online but what would a much better trigger be worth to you? Much more than $75 I hope. In many of these guns there is a night and day difference- trust me. Is CZ that inconsistent in production? I bought my OD green P07 online, and the trigger was fine, and quite useable as it came out of the box..I just changed a few minor things to suit me..Honestly, you should be fine..
My trigger seems just fine. I was initially a little concerned from some posts I read but that was quickly a nonissue. I can’t wait to shoot it some more. Only thing I’m really interested in doing to it is adding night sights. Any recommendations guys? In short, yes. If it’s just gritty, that is not a big problem. Polishing and shooting will likely fix that If it stacks, you might never get rid of the stacking, and this is a problem in getting good accurate hits in DA. I have an EXCELLENT urban gray p09 and the ease with which it hits in DA is truly awesome and spoils you against “bad triggers”. I picked it out at a large gun show from about 15 samples that I saw at the show. It was the only one that I would say was excellent while there were probably others that were acceptable. I would say half of the 15 or so were terrible. So yes CZP guns are a bit inconsistent. I picked up a P-07 last week. Night Fision is one of the few major manufacturers that offers night sights for the P-07. Hoping to see some more comments on this before I order. If you want a similar sized gun, give the Sig P-225-A1 a look. Lower capacity, a few ounces heavier, but it has a much nicer trigger! That's great if you have someplace that stocks them, in my area, most places stock either Glocks, or S&W M&P's, with a smattering of Colts or Springfield armory 1911's sprinkled in..So, for many of us, we don't have a choice but to buy online.. I finally found a place that stocks CZ's (and they are supposedly the largest stocking dealer in the state) but I haven't been there yet, as it's about 45miles one way, from me.. I hear you. I now have only one shop near me that stocks them and usually no P guns. Again, I got mine at a show. The ones I bought at a show IN person are my best triggers. One other I bought on-line, I called and asked them to check the trigger before shipping for stacking and they did it. It was still gritty, but now is good. The big problem with CZ P guns is QC and supply. The Omega trigger has some advantages, but can lead to stacking in DA. I believe when the frame is molded a bit 'off', it can be pretty bad. For people who don't use the DA pull this is a non-problem. For those of us who use the DA, this is a pretty important issue. I’ve only got 250 rounds through my new P07 but it seems like I got a good one. I shot two magazines DA only and was happy with the trigger. I expect it’ll get even smoother in time. I agree though, I don’t like to buy pistols I haven’t put hands on but like many others I just don’t have the ability with CZs in my area, unless it’s a P10. I am already in love with this pistol though. My Sigs are going on hiatus for a while. ....I am already in love with this pistol though. My Sigs are going on hiatus for a while. Ha. I seem to be hearing this a lot lately.